News - Green in mood for Brits romance? Green in mood for Brits romance? 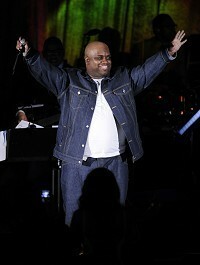 Cee Lo Green has said he might find time for romance after his Brit Awards gig. The singer has jetted into London fresh from an A-List duet with Gwyneth Paltrow at the Grammys - and he hinted that some flirtation could be on the agenda. "These Brits are going to be a first for me so I'm really excited, but I may just have enough energy left to spend the night with some beautiful stranger," Cee Lo told the Sun. The down-to-earth Forget You singer - who reportedly celebrated post-Grammys with chicken wings and ginger ale - said he doesn't make many diva-like demands backstage. "We don't really go for much. I ask for some finger food like sandwiches and a bit of liquor, but that's it," the 36-year-old added. "When I was in Gnarls Barkley we used to ask for a clean pair of socks with the band's name printed on the side, but that's as big as we got. "How are your fans going to feel if they see you ordering all of this stuff that never gets used, just so you'll agree to come and play for them - you've got to keep it all in perspective."